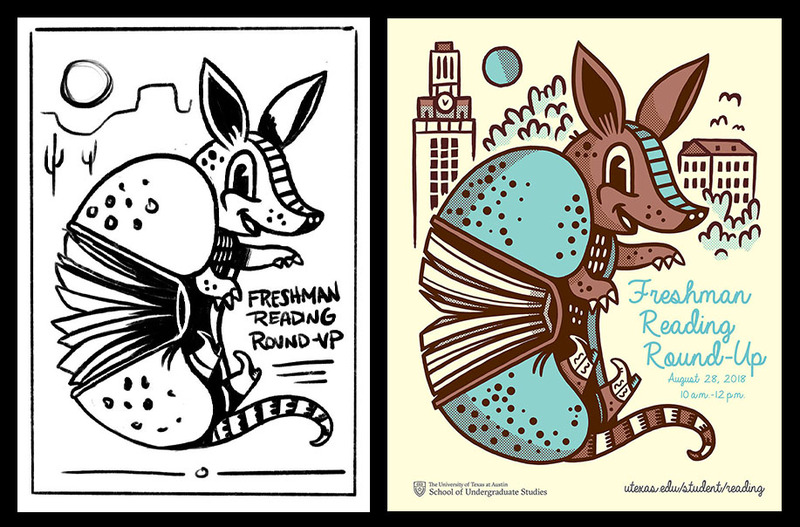 Every year, the School of Undergraduate Studies commissions artwork for its annual Freshman Reading Round-Up program. 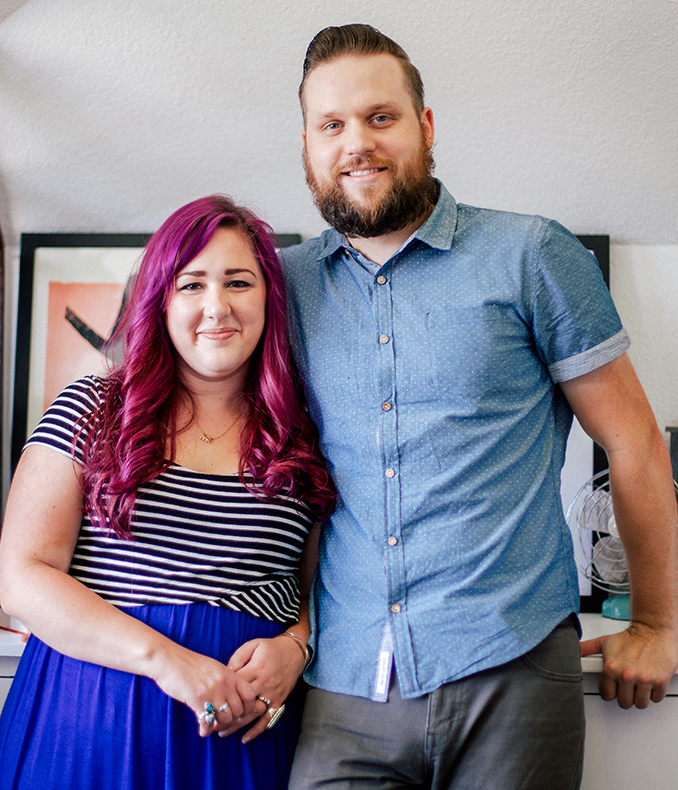 This year’s art was created by Brave the Woods, an illustration studio run by Krystal and Brad Woodward. Tell us about your company Brave the Woods. Brave the Woods is more than a company, it’s our life motto–to take chances, stay curious, and do what makes you happy. Our business goals coincide with our family goals. We focus on the type of work that is most fulfilling to us, which means we work for good causes, make children’s books, and work on educational and nature-related projects. Walk us through your process in designing this years’ Reading Round-Up artwork. First off, any excuse I have to illustrate an armadillo, I’ll take it! I really wanted to have an animal be sort of a mascot for the event so I started sketching animals you would find around Austin. When I started drawing an armadillo I noticed the lines on his shell looked like an open book with the pages fanned out. So I started drawing my character and made sure to have him hugging the text and leaving room around to fit in some UT scenery. It was a ton of fun to make. What led you to create Artists for Education, your new side project ? In our family we have teachers who have asked us to create educational artwork for their classrooms. We dug deeper to find out that they don’t have the funds to purchase the artwork they need, and there really isn’t any out there worth buying. The artwork in schools is outdated and ineffective. That led us to coming up with a way to solve both problems at once. We reached out to our most talented artist friends and asked if they would be willing to create an educational poster that we could allow teachers to download for free. And the response was incredible. Over 150 artists have agreed to help make posters and already, we have a massive body of educational artwork available on the site, spanning all the major school subjects. Our goal is to continue having amazing posters made to help aid teachers in the classroom, and start sending out physical posters to schools in need. Everyone can help by purchasing a poster for the teachers in their life, or by purchasing a poster for you home, office, or kids’ rooms! By doing that, we can help give some money to our artists for their time and send out printed posters to schools who desperately need them. What advice do you have for students interested in a career in design? Don’t feel like you have to choose one avenue of design right off the bat. Take time to explore everything that interests you. Over time you will start to see what you gravitate towards, and sometimes it isn’t a single path. In my career I have done lots of different types of design and illustration professionally, and now I am finding I like to merge both design and illustration together in ways that interest me. Having knowledge in all those styles and jobs can aid any work you do and help you communicate your ideas with others. My favorite book is To Kill a Mockingbird. Atticus Finch is the man, and the movie was excellent as well! What’s your connection to Austin, Texas? What are your favorite things about the city? When my wife and I decided we would start our own business we said we would move to Austin, Texas to do it. So 5 years ago we did just that and loved every minute of our time living in Austin. We loved all the live music, the incredible creative scene there, the hot weather and amazing food. We loved spending time walking downtown and kayaking on the river. There are too many amazing things about the city to list! We’ve since moved to Boise, Idaho, but we’ll always come back to visit Austin.